I guess just about everyone else in the world already knew this, but me: There are two ways to put up a Christmas tree – the single man’s way and the right way. Ok, I guess I’ve known it for several years, but just didn’t want to admit it. But THIS year . . . well, this year it became even MORE apparent. Somehow every year I think I’m going to have time to do all this great, as-seen-in-Better-Homes-and-Gardens Christmas decorating around the house. And every year I don’t. And what’s even more laughable is that I think I’m going to do all this great stuff AFTER Thanksgiving. Well, as a college instructor, my two busiest times of the year are the two finals weeks of each semester. And one of those just so happens to coincide with the two weeks after Thanksgiving. I gave real thought this year to instead of using an ARTIFICIAL tree for Christmas, we could use a REAL box! Growing up, I must have been a kid who kept repeatedly putting his hand on the hot stove – because I just don’t seem to learn my lesson. At least not in the holiday decorating arena. Sometime during that time between Thanksgiving and the end of the semester, I got it in my head that THIS YEAR I would buy an artificial tree. In the past, we’ve always had a real tree and all the joys that go with it – pine needles on the floor, sticky hands, and a trail of water from the sink to the base of the tree as I tried to water it on a regular basis. Well, a regularly occasional basis, anyway. So I picked one out (they had a wide selection of two to choose from) and brought it home. 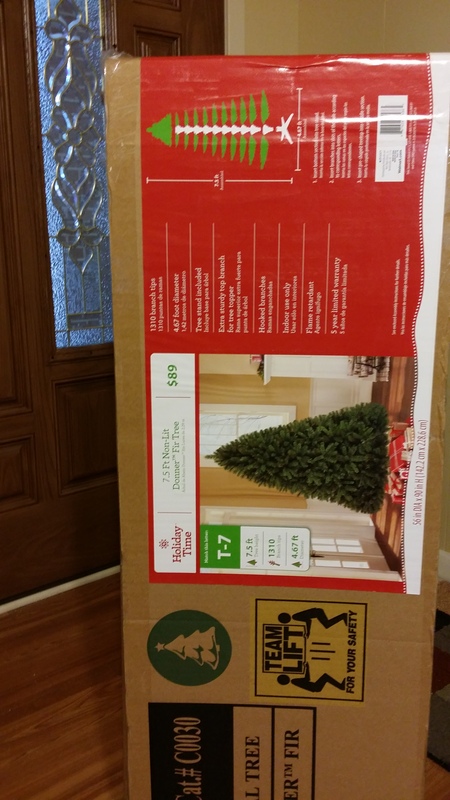 After I brought it inside, I plopped down in a chair and stared at the box with the picture of what the tree was SUPPOSED to look like pasted on the outside. And for the briefest of moments I entertained the idea of just using the box AS the tree. I mean, it was a really good picture. In fact, it probably looked better than what our actual FINISHED product would look like. And in my mind I pictured presents scattered around the box. And thought to myself . . . ahhhhhh, wouldn’t that be easy . . .
And we did finally get the tree up . . . yesterday, December 22. How sad. But unlike many things in my life, at least I didn’t wait until the last minute to put it up. You know, the last minute, like say early Christmas morning. But it’s up now, and it does, in fact, look nice. But more than anything the kids like it. Now, if I just had some presents to put under it . . . I’m kidding! I did all my shopping early this year – Last week. So another year almost done and another lesson almost learned. Yeah, I know. I should have put up the tree a long time ago. Very selfish of me. I know, I get it. But here’s the good news for the kids: they will still have plenty of time to enjoy the tree because I doubt I get it down before Valentine’s Day . . .